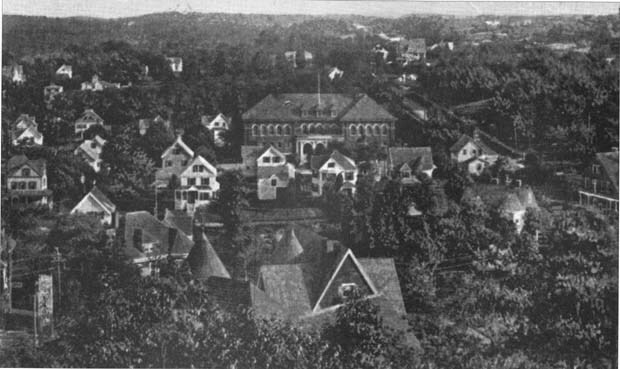 "Wakefield's residential sections include the West Side, near the Warren School and past the 'Park Gates' (at lower left of photo). In a tribute to Wakefield's businesses published in the 1890s the following is an excerpt of what was said about the residential community. 'As regards the advantages offered by Wakefield as a Home Town" it may be truthfully said that this community will make a most favorable showing as a result of the most thorough investigation that could possibly be made. Of Wakefield it has been said: 'She stands ready every day in the year to extend a cordial welcome and invitation to good men and women, of every name and race, to cast their lot within her borders, and help make her more and more a centre of intelligence, virtue and enterprise, a place of beauty, a city of homes. ''And that is just what the Wakefield os the future will be, - a city of homes. Every year it is becoming more generally appreciated that a great mercantile and manufacturing city is not a fit place for a real home, and that the advantages of a town like Wakefield as a place of residence are so many and important that no family that is in a position to utilize them can afford to neglect to do so. So the future of Wakefield will be a veritable city of homes, and by both the number and character of her population will be entitled to a leading position among the prosperous and influential communities of the old Bay State.'" -- Text from calendar by Jayne M. D'Onofrio. Photo courtesy of Susan Miranda Byrnes. “H.M. Warren School and vicinity, circa 1910,” NOBLE Digital Heritage, accessed April 22, 2019, https://digitalheritage.noblenet.org/noble/items/show/6968.